It has been nearly eight months since I moved to this small, oil and gas-rich country, Qatar, in the Gulf. In some way or the other I’m adjusting the life here and it hasn’t been that difficult. And life here seems like revolving always around eating! We keep visiting a few restaurants around the town and try out new dishes, despite Vij generally enjoys homemade food. One dish that neither he nor I can say no to, is Shawarma. This simple and yet tasty dish always pulls us towards restaurants pretty often. And I haven’t come across a person who has not liked shawarma, if not crazy about it. If anybody living in the Middle East has not tasted it, trust me, they have not lived their life to the fullest, because I’ve seen even those who don’t eat non-veg back home relishing shawarma here! Trust me, not just Arabs, even people from other nationalities also are hooked on to this Arabic delicacy. Let me tell you what it is all about. 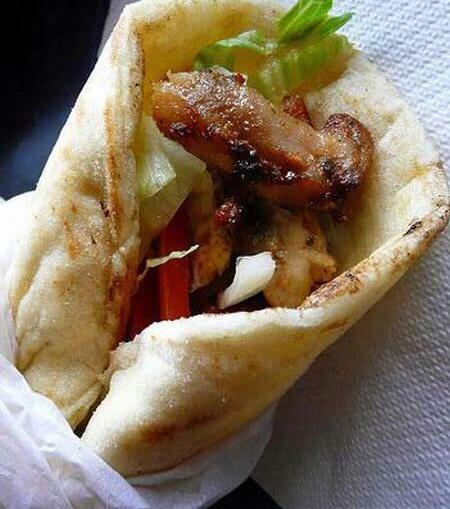 Shawarma is nothing but pita bread sandwich, with beef, lamb or chicken. It is very much similar to a Greek gyros or a British donner kebab served with sesame paste. They sell like hot cakes here and no matter where we go, unless we are around the desert sand dunes, we can spot shawarma shops. We can always find massive towering logs of revolving meat and their vertical skewer and then roasted slowly to perfection against a burning grill. I have tried out several recipes, including shawarma, at home. Believe me, the taste definitely matters. Cooking shawarma at home can be really tedious and is very difficult to make an authentic one. Reason? It needs Makina, shawarma grill, and sorry to say this, it costs a bomb. Depending on the size and quality the price varies. I heard they range somewhere between $200 and $3000 and above. But the thing is, do we really have that much of time to stand behind that burning hot grill? Well we have to laud the men who stand behind that hot grill all the day in this scorching heat and make those mouthwatering shawarmas. Trust me I can’t even stand near that grill when those guys make shawarmas for us in shops. Sometimes I wonder the capacity of them to bear that heat. Had I been in his place, maybe I would have fainted every half an hour because of the heat. So better to head towards any good shawarma shop and pay just QR8 to QR12 and enjoy the best taste without any hassles. Don’t be surprised if I tell you that every time we eat shawarma they taste different, thanks to the method of preparing at every shop. The method of slicing the meat into thin slices and building up logs on the grill does not change, but the spices used will differ, making a great difference in the taste. We found them to be different and less spicy, rather call it bland, in Arabic shops, whereas Indian shops make them more spicy. Al Sadd has good shawarma shops and often we bump into any of them. You have to just see the number of people coming and buying shawarmas to believe the popularity of this. If you are not living in the Middle East and still interested to prepare shawarma at home, don’t worry. Learn a few tricks that can give you the yummiest chicken shawarma without the need of any makina. Here’s a simple recipe. Chicken: ½ kg (cut into thin strips. I use 75% of chicken breast and 25% boneless chicken thighs, as the fat in the thighs help chicken to get a nice flavor and colour when grilled). Combine the spices, salt, garlic, onion, lemon juice and vinegar and mix well and marinate the chicken overnight in the fridge. Grill the marinated chicken in a George Forman grill till cooked (it took me 10 minutes) or on a BBQ grill. After cooking, shred the chicken into thin pieces and keep it aside. Spread mayonnaise on pita bread, add shredded chicken, cabbage, cucumber pickles and chopped tomatoes, and roll the bread into shawarma.